508TH RETURNS TO THE U.S.
CAMP CHICKAMAUGA, Japan - Paratroopers of the 508th Abn. RCT this week said farewells to their best Japanese friends - the children of orphanages in Kumamoto and Beppu. The airborne soldiers, who leave for the U.S. this month have given over $53,000 for the support of eight homes in the year they have been in Japan. During the goodbyes, Beppu Mayor Chikara Bakaguchi presented Chaplain (1st Lt.) Clifford E. Keys with a scroll of appreciation for the work he and the men of Camp Wood have done for four homes in Beppu. 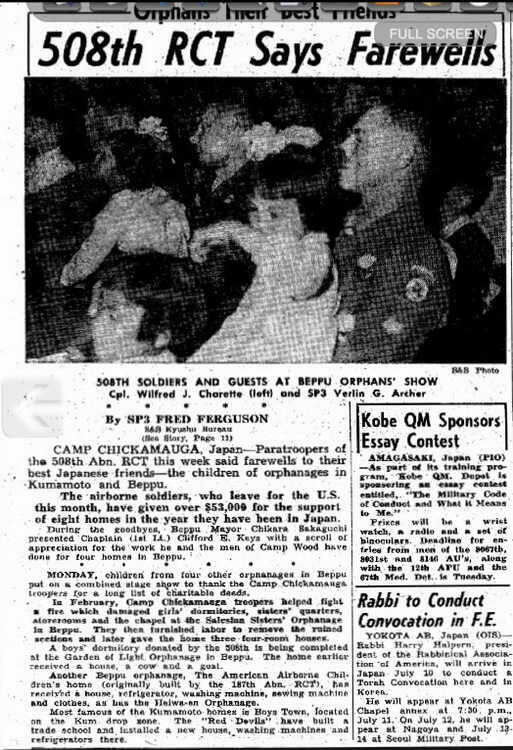 Monday, children from four other orphanages in Beppu put on a combined stage show to thank the Camp Chickamauga troopers for a long list of charitable deeds. In February, Camp Chickamauga troopers helped fight a fire which damaged girls' dormitories, sisters' quarters, storerooms and the chapel at the Salesian Sisters' Orphanage in Beppu. They then furnished labor to remove the ruined sections and later gave the home three four-room houses. A boys dormitory donated by the 508th is being completed at the Garden of Light Orphanage in Beppu. The home earlier received a house, a cow and a goat. Another Beppu orphanage, The American Airborne Children's Home (originally built by the 187th Abn. RCT), has received a house, refrigerator, washing machine, sewing machine and clothes, as has the Heiwaen Orphanage. Most famous of the Kumamoto homes is Boys Town, located on the Kum drop zone. The "Red Devils" have built a trade school and installed a new house, washing machine and refrigerators there. FORT CAMPBELL, Ky. The military population of Fort Campbell will begin to grow again Sunday with the arrival of five train-loads of troops from overseas. They are members of the 508th Airborne regimental combat team, who reached San Francisco yesterday aboard the USS Mitchell to entrain for their new base here. The Mitchell sailed from Moji Port, Japan, on July 7. Trainside ceremonies, in which the new arrivals will be welcomed by Maj. Gen. Thomas L. Sherburne, commander of the 101st Airborne division and Fort Campbell, will be held here with arrivals of each of the five trains. The first train is slated to arrive at 7 a.m. CST. the second at 8:30 am. ; the third at 10:10 a.m.; the fourth at 11:35 a.m.; and the fifth at 12:30 p.m.
Two of the trains will come here by way of Nashville, and three by way of Hopkinsville, Ky.
None of the dependents of the soldiers aboard will be with them. Greeting the new arrivals at the trainside ceremonies, in addition to General Sherburne, will be the 101st Airborne division and 74th Army bands; the 101st Airborne division honor guard: and the massed colors of the 187th Airborne combat group (provisional), the 284th Field artillery battalion, the 937th Engineer group, and the 3400th Service unit. PFC. RONALD GARRY and Mrs. Garry, and SP3 and Mrs. JAMES E. FINDLEY and daughter, Sherie, left this morning for Camp Campbell, Ky., where the two service men will be stationed, pending Pfc. Garry's separation from service in December after a two year duty period. Pfc. Garry, son of Mr. and Mrs. Anthony Garry of 3201 James Terrace, and Sp. Findley both served at Camp Beppu, Japan, with Co. K, 508th AB Paratroop Div,, for one year. The Findleys were houseguests of Pfc. Garry's parents last night, after coming to Alton from Ottumwa, Iowa. Mrs. Norma Garry, Pfc. 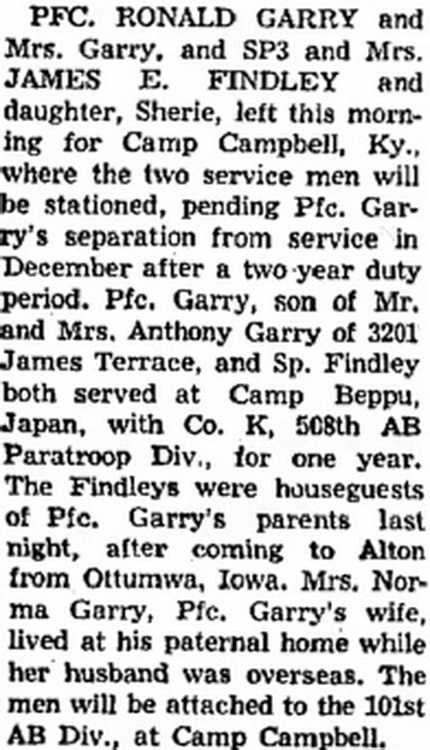 Garry's wife, lived at his paternal home while her husband was overseas. The men will be attached to the 101st AB Div., at Camp Campbell. FLOYDADA March 30 (Special) --- Sgt. 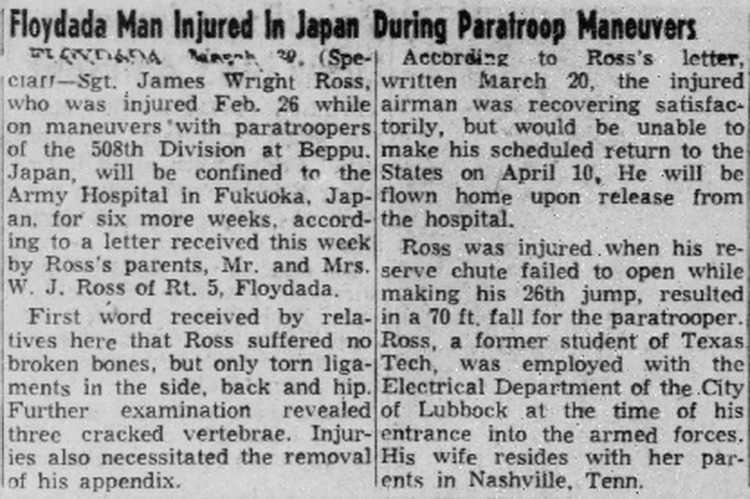 James Wright Ross, who was injured Feb. 26 while on maneuvers with paratroopers of the 508th Division at Beppu, Japan, will be confined to the Army Hospital in Fukuoka, Japan. for six more weeks, according to a letter received this week by Ross's parents, Mr. and Mrs. W, J. Ross of Rt. 5, Floydada. First word received by relatives here that Ross suffered no broken bones, but only torn ligaments in the side, back and hip. Further examination revealed three cracked vertebrae. Injuries also necessitated the removal of his appendix. According to Ross’s letter, written March 20, the injured airman was recovering satisfactorily, but would be unable to make his scheduled return to the States on April 10, He will be flown home upon release from the hospital. Ross was injured when his reserve chute failed to open while making his 26th jump, resulted in a 70 ft. fall for the paratrooper. Ross, a former student of Texas Tech, was employed with the Electrical Department of the City of Lubbock at the time of his entrance into the armed forces. His wife resides with her parents in Nashville, Tenn.